To better meet our clients’ diverse needs, we’ve added cutting-edge, seven-axis computer numerical controlled (CNC) grinders to our manufacturing floor. With a wide array of features and capabilities, our seven-axis state of the art CNC thread grinders can process any material, in a wide range of dimensions — from 0.25 inches to 8 inches in outer diameter (OD) and from 1 inch to 13 inches in length. Most importantly, these thread grinders can hold incredibly tight tolerances — as close as +/-.00005 inches — and can generate intricate forms, including helical and annular forms, with small radii. 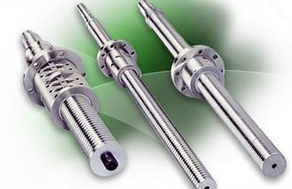 This equipment allows us to handle medium- to high-production volumes with speedy turnarounds. 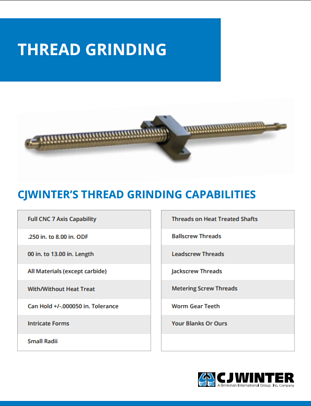 With our new thread grinding service, CJWinter is now able to provide top-quality ground ball screws and lead screws, offering products that are cleaner, more accurate, and more precise than ever before.